Bryan Black AKA Black Asteroid returns to Electric Deluxe with his most precise and daring invention yet. 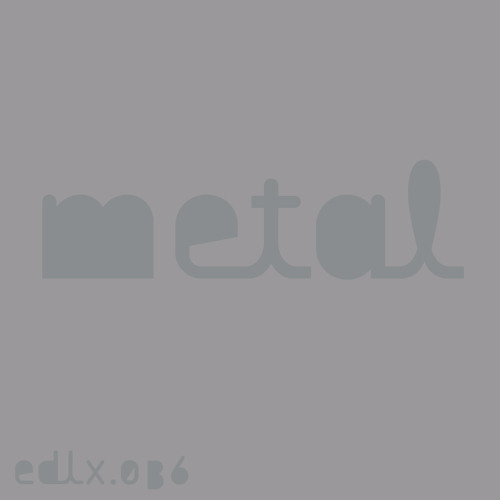 ‘Metal’ picks up from where the ‘Black Acid EP’ left off with more sonic alchemies sounding unlike anything else. The former Prince engineer turned MOTOR front man turned galvanic techno DJ, producer and performer has had an incredible run in his latest guise. Since debuting on CLR with ‘The Engine EP’ over a series of well-shaped and energetic releases Bryan Black has forged a distinct and unique signature that is tactile, otherworldly and utterly timeless. Ingenious sound design has become his calling card, while Black’s award winning MOTOR heritage never seems far behind. Moments on ‘Black Acid’ felt like he brought the band to the DJ booth. And with ‘Metal’ the sentiment rings even truer. This is “heavy metal techno,” says Black, “but in a very restrained and controlled way.” Indeed the hum of guitars (synths routed through guitar pedals) whirr through lead track “Metal,” a taut and punchy workout spliced with token Black Asteroid weirdness. Meanwhile Black gets even more contained on the masterfully metronomic “Turbine”. Droid affiliate Luis Flores and Pinion (Bobby Dowell) then split “Metal” off into its opposing sectors. Flores takes things straight the dance floor, while Pinion ramps up the noise and clangor to turn in a real unholy “Metal” monster. Another must for Black Asteroid fans and for those who like their techno cast from mysterious molds.